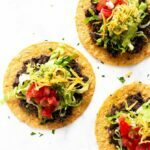 Black bean tostadas are an easy weeknight vegetarian and gluten free dinner the whole family will love! Only 10 minutes of prep time, and easily customizable! #tacotuesday is a pretty big thing around here, but sometimes we like to kick it up a notch and make tostadas. Sometimes we even have them for breakfast. 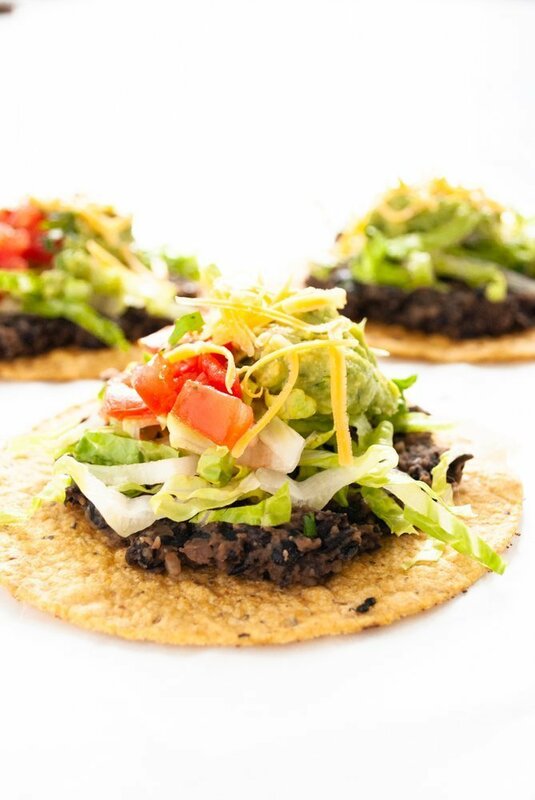 These black bean tostadas are vegetarian, but easily made vegan by simply omitting the cheese. 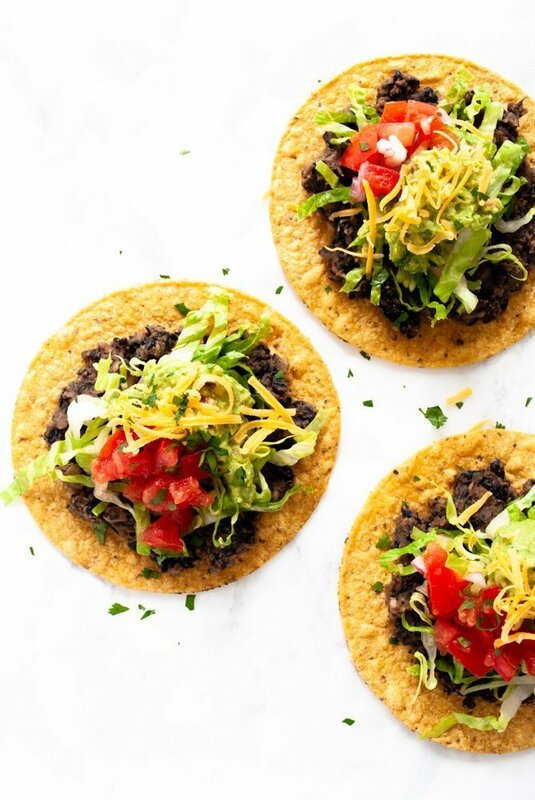 I’ve topped these tostadas with shredded lettuce, pico de gallo, guacamole and cheese, but the sky truly is the limit when it comes to toppings – throw whatever you fancy on it! 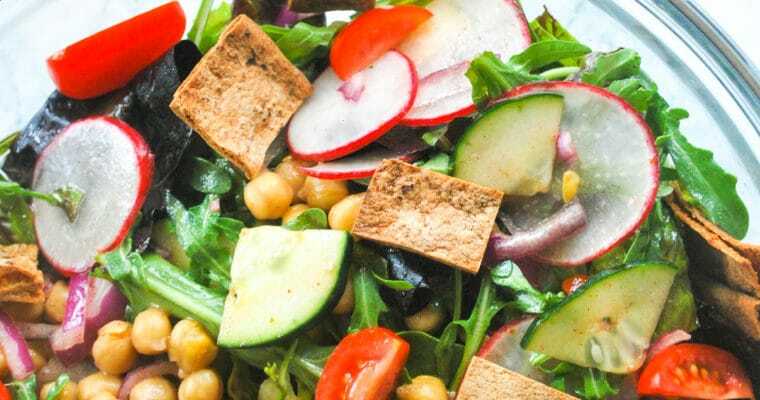 This recipe makes 12 tostadas which can either be eaten as a meal for 4 or 5, or try serving it platter style at your next get together or party! All around this meal comes together in about 20 minutes which is already pretty awesome, but if you have pico do gallo already on hand then you can easily have these tostadas on the table in 15 minutes. There are 3 parts to this dish: the black beans, the guacamole and the pico de gallo. I like to make the pico do gallo and the guacamole first so the flavours have time to marinate. 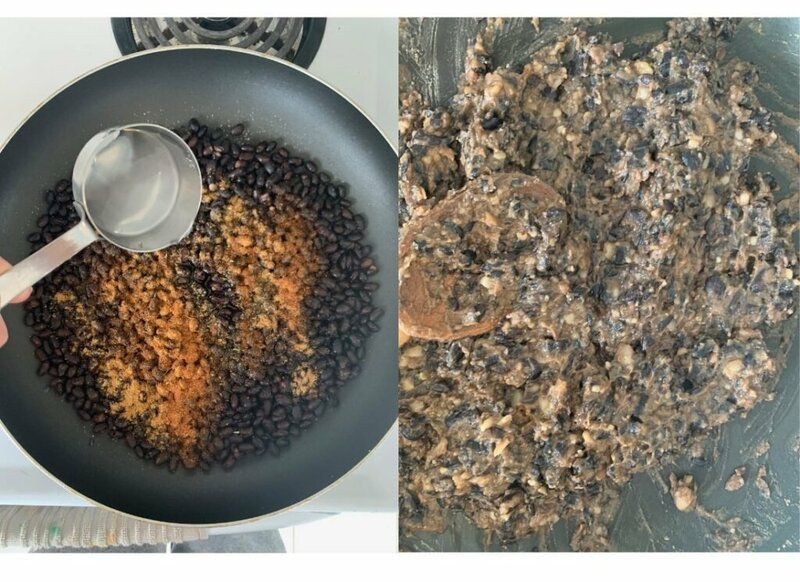 If you already have these things on hand you can skip straight to the black beans! Slice the avocados in half and remove the seeds. Using a spoon, scoop out the insides of the avocados and put them inside a medium bowl. Using a fork, mash the avocado until it reaches a smooth consistency. Add the diced tomato, cilantro, diced red onion, lime juice and salt. Stir with a spoon until combined. Find the instructions for our pico do gallo here. Heat a large frying pan to medium heat. Add the black beans, along with the spices to pan and heat for a couple of minutes while stirring the beans to mix the spices. When the beans have heated up a bit, begin to mash the beans with the back of a wooden spoon if you want to be traditional, or make your life easy and use a potato masher. 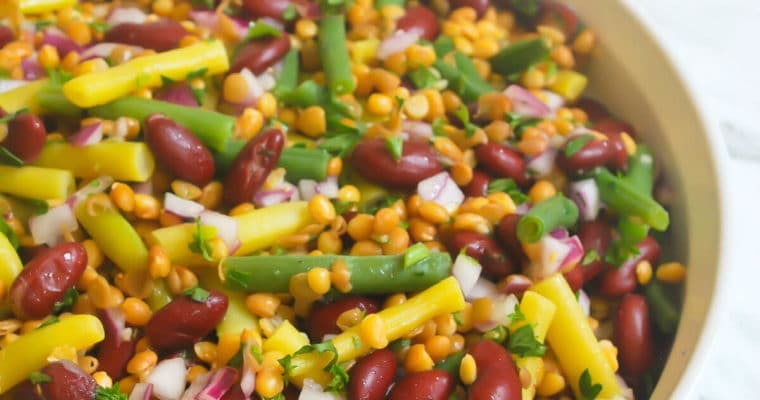 As you mash the beans, add in water (a couple of tablespoons at a time) and continue to mash the beans mixing the water in. Continue adding water and mashing the beans until the consistency that is spreadable, but not mushy. When the beans have been cooked, remove from the heat and set aside. Spoon a bit of black bean mixture on top of a tostada and spread around to cover it. Top with shredded lettuce, guacamole, and pico de gallo and shredded cheese. 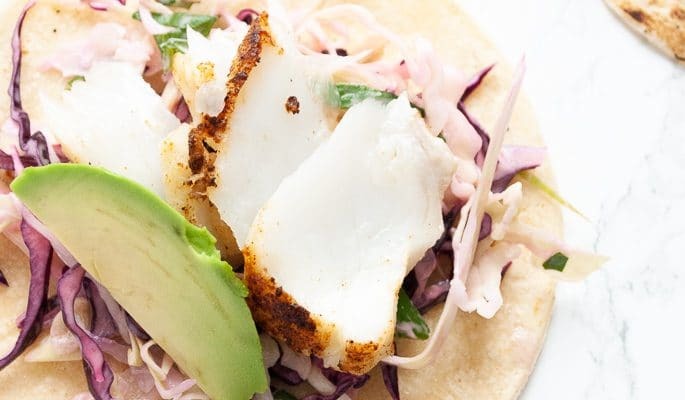 Want to see more recipes like this?? 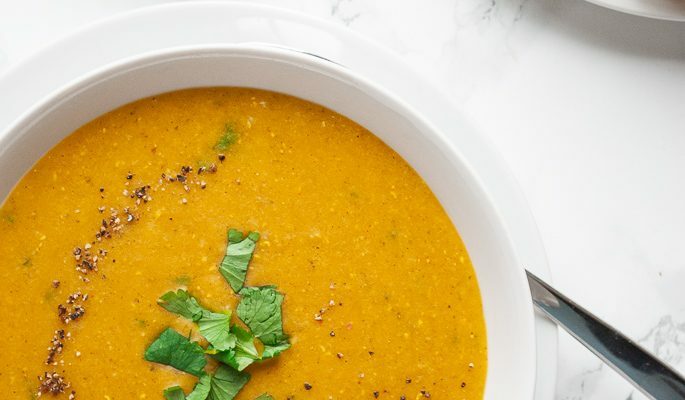 Sign up for our newsletter to have new recipes delivered to your inbox, follow us on Instagram or like our Facebook page. 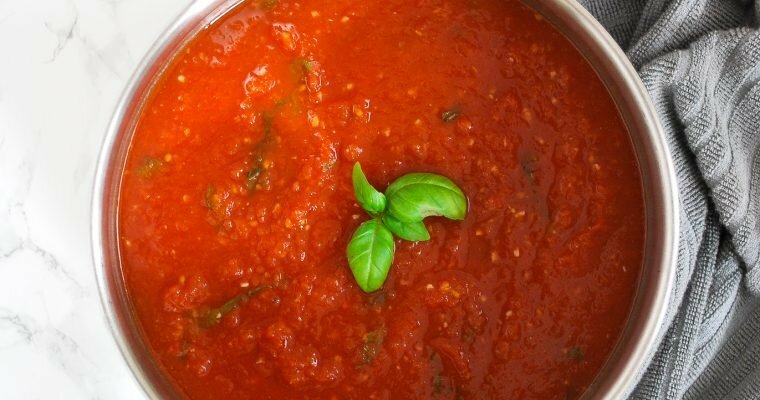 If you have made this recipe we’d love to see it! Tag us on Insta @loveandgoodstuff. Loved this? Don’t forget to rate it below! Remove the avocado from their skins and mash in a medium-sized bowl. Add the diced tomato, onion, cilantro and lime juice to the avocado bowl and stir through seasoning with salt. Heat a large frying pan over medium heat. Add the beans and spices and begin to mash them together as the beans heat up. Add water as needed until they have reached a spreadable consistency. Spread some black bean mixture on a tostada, top with shredded lettuce, pico de gallo, guacamole and cheese then enjoy!